The Teal is found in North America, subspecies Anas crecca carolinensis, and Europe, Asia and Africa, Anas crecca crecca. It is partly migratory but in most of Europe it is resident all year. 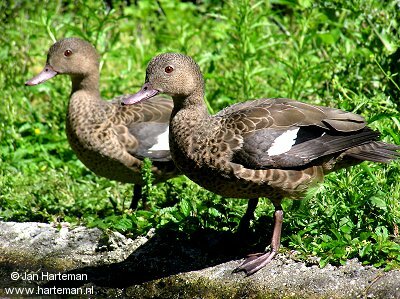 It is a dabbling duck and one of the most abundant with about 7 million in North America, and over 1 million in Europe. 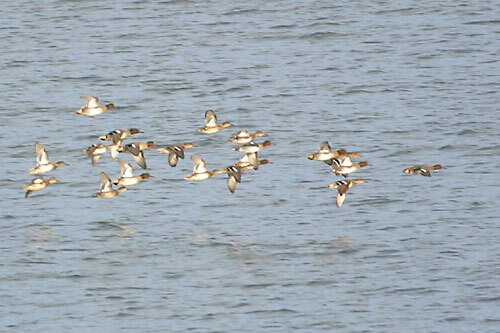 It is also the smallest duck and, when flying in dense flock formation, it looks almost like a wader. In flight, it shows a broad white wing-bar and a glossy green speculum. In breeding plumage, picture no. 1 above, the male has a chestnut head with green sides surrounded by a thin yellow line. In eclipse plumage, above picture, the males look very like the females. 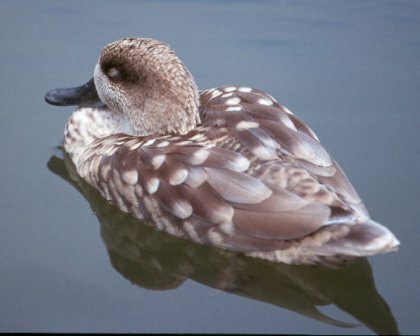 The Marbled Duck, or Marbled Teal, Marmaronetta angustirostris, is a medium-sized duck. It used to be included among the dabbling ducks, but is now classed as a diving duck. in Turkey, Armenia, Azerbaijan, Iraq and further to the east in western India and western China. Its breeding habitat is lowland where they lay their eggs in long grass or in high trees. They may lay 7 to 10 cream eggs. and have been encountered in the winter period in the Sahel zone, south of the Sahara. off-white, with a dark eye-patch and shaggy head. Juveniles are similar but with more off-white blotches. In flight, the wings look pale without a marked pattern, and no speculum on the secondaries. wintering flocks have been reported in some areas. The largest winter concentration known is in Khuzestan, Iran. These birds feed mainly in shallow water by dabbling or up-ending, occasionally diving. Little is known of their diet. This bird is considered vulnerable due to a reduction in population caused by habitat destruction and hunting. and Latin angustus, narrow or small and rostris billed. "marbles" for which this species is named for. 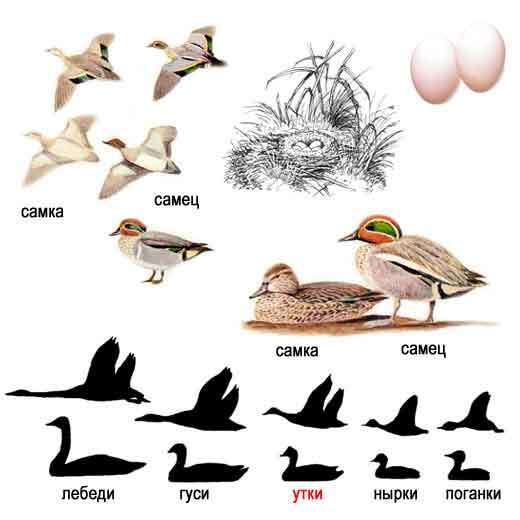 The sexes are similar, with hens having yellowish patch at the base of the bill. Males seem to have a larger head than hens, due to a crest that is used when courting hens. 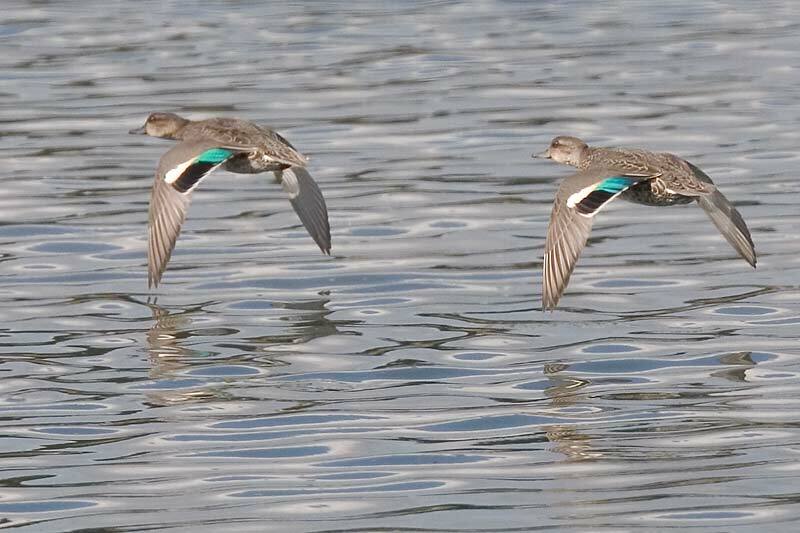 Both sexes lack the metallic wing speculum seen in other teal. 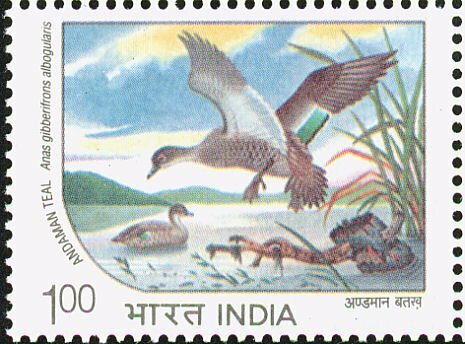 The Andaman Teal, Anas albogularis, is a species of small duck found in the Andaman Islands of India. 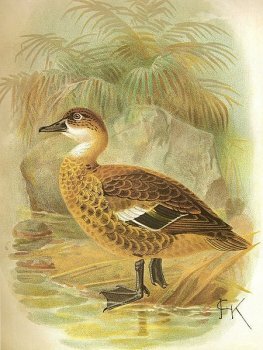 The species was considered as a subspecies of the Sunda Teal. The species is dark brown with buffy markings. The face and throat are pale with a white ring around the eye. The bill is bluish grey and the iris is red. They are found in inland pools as well as mangroves and lagoons. They feed at night in rice fields. The breeding season is July to October and nests in reed patches. The nest is made of grass and about nine eggs forms the clutch. They were formerly considered to breed in tree hollows but recent studies found no evidence. They feed mainly on molluscs and arthropods. A population estimate of 500 to 600 was made in a survey conducted in 1995-98. Recently, Rasmussen and Anderton (in press) have elevated Andaman Teal to species level as Anas albogularis. 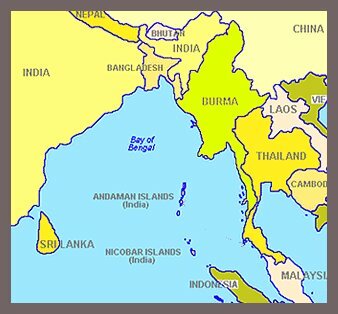 as Vijayan and Sankaran have estimated that not more than 600 are left in the Andaman Islands. Source 'Journal of the Bombay Natural History, Vol XII, No. 2, 1898. 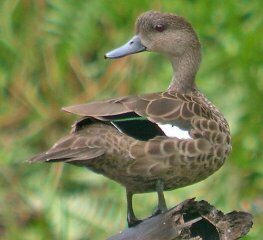 The Sunda Teal, Anas gibberifrons, also known as the Indonesian Teal, is a dabbling duck found in open wetlands in Indonesia. The species formerly included the Andaman Teal, Anas albogularis, and the Grey Teal, Anas gracilis, as subspecies. 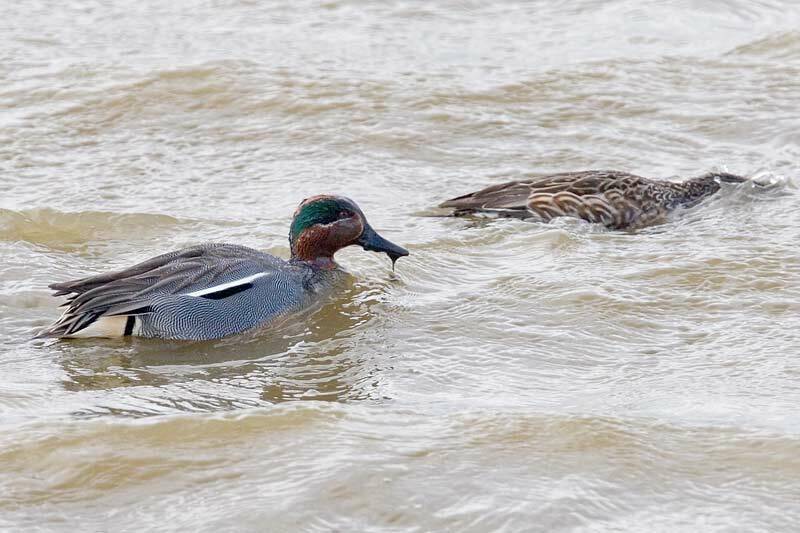 in contrast to the related Chestnut Teal, Anas castanea, whose male and female are strikingly different. lighter coloured neck, paler face and especially the bulging forehead. The Andaman Teal has a variable amount of white on the forehead and around the eyes. with a stubbier bill. Juveniles are paler than adults, especially on the head. The Sunda Teal nests near its favoured freshwater lakes and marshes, usually on the ground, but also in tree holes or rabbit burrows. This is a vocal duck, especially at night. 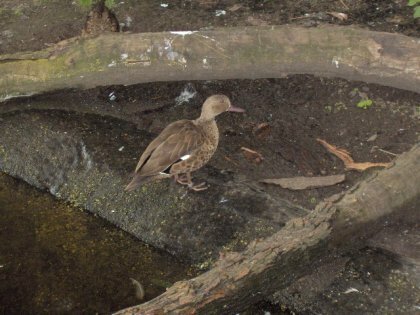 The male gives a soft preep, and the female has a loud quack. Rennell Island Teal, Anas gibberifrons remissa, formerly found on Rennell Island in the Solomons. The Grey Teal, Anas gracilis, was formerly considered to belong into this species. 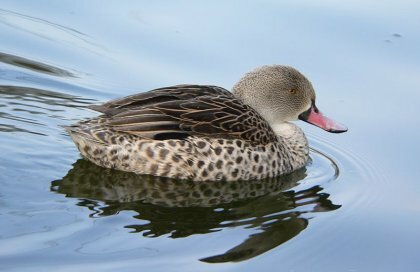 The Cape Teal, Anas capensis, is a 44-46 cm long dabbling duck of open wetlands in sub-Saharan Africa. This species is essentially non-migratory, although it moves opportunistically with the rains. (young birds lack the pink). 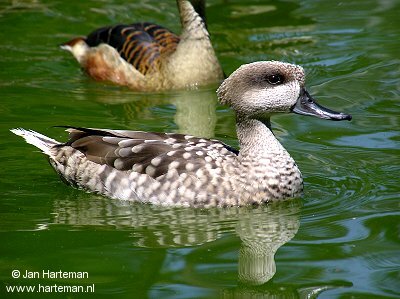 The Cape Teal cannot be confused with any other duck in its range. 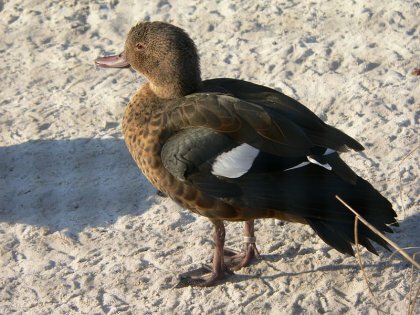 It is a thinly distributed but widespread duck, rarely seen in large groups except the moulting flocks, which may number up to 2 000. This species feeds on aquatic plants and small creatures (invertebrates, crustaceans and amphibians) obtained by dabbling. The nest is on the ground under vegetation and near water. This is a generally quiet species, except during mating displays. 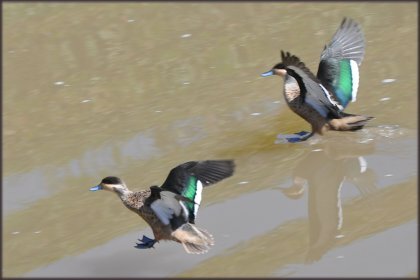 The breeding male has a clear whistle, whereas the female has a feeble "quack". 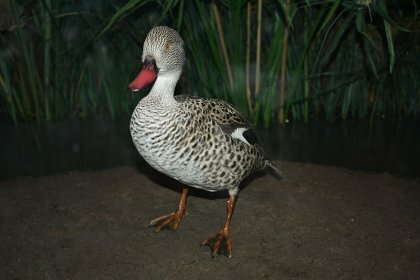 Bernier's Teal Anas bernieri (also known as Madagascar Teal) is a duck species of the genus Anas. It is endemic to Madagascar, where it is found only along the west coast. heaviest on flanks and breast. It has a black speculum, and its bill is pinkish gray and slightly upturned. It prefers mangroves and rarely leaves this habitat where it favors open shallow ponds and lakes, preferably brackish. They tend to eat invertabrates. They nest in tree cavities, mainly mangrove. This bird is threaten from extinction because of trapping, shooting and forest destruction. The binomial commemorates the French surgeon Chevalier J A Bernier. 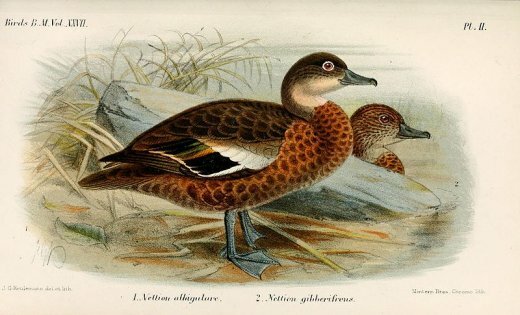 The Hottentot Teal, Anas hottentota, is a species of dabbling duck of the genus Anas. South Africa and Namibia. In west Africa, and Madagascar it is sedentary. 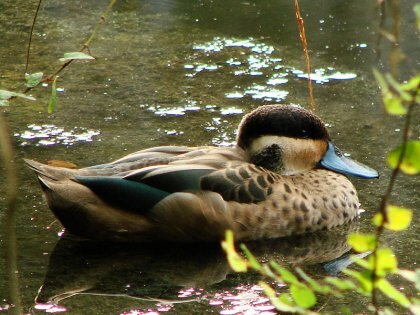 The Hottentot Teal breed year round, depending on rainfall, and stay in small groups or pairs. They build nests above water in tree stumps and use vegetation. This species is omnivorous and prefers smaller shallow bodies of water. Waterbirds (AEWA) applies. 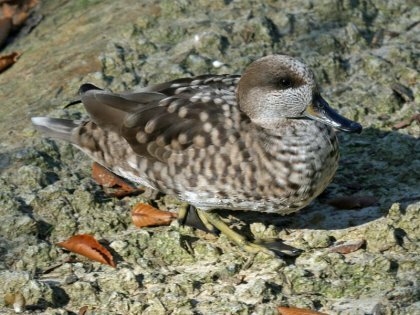 The status of the Hottentot Teal is Least Concern.